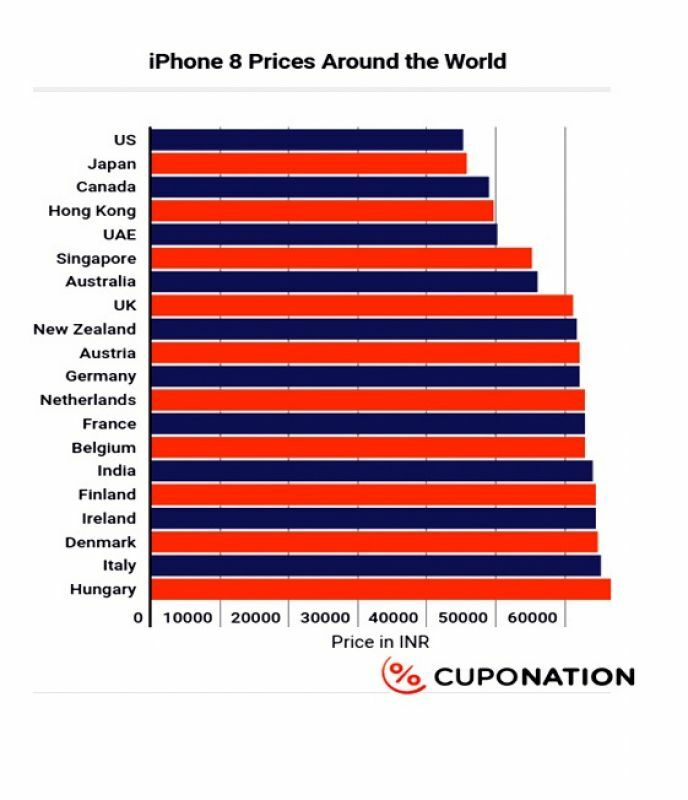 iPhone 8 costs less in India than European Nations! The iconic iPhone 8 has varied cost spread across the globe. India holds the fifth place among countries that sell the 8 with the most expensive price tag! A research from a reputed agency has some curious revelations. Results shows that India ranks fifth amongst countries that sell iPhone 8 with the highest price tag. According to its legacy, the Apple iPhone has always been one of the most expensive smartphones one can buy in the world. However, due to the varying economies of different markets across the world the prices differ. The iPhone has always been luxurious in some countries when compared to its actual price in the US market. Indians have to pay a lot for the iPhone and the latest iPhone 8 is no exception. A research undertaken by Cuponation shows that India stands good in comparison to European counterparts. It is fifth in the list of those countries that sell the 8 with the most expensive price tag. The 64GB edition 8 sells for a price of Rs. 64,000, which is Rs. 18,796 more than that of the American iPhone 8 carrying a price tag of Rs. 45,204. However, India still gets the 8 cheaper than five European countries — Hungary (Rs. 66805.23), Italy (Rs. 65170.65), Denmark (Rs. 64736.58), Finland (Rs 64428.45) and also Ireland. The Japanese sell the iPhone 8 for the second cheapest price tag of Rs 45,739. Even UAE sells the iPhone 8 for Rs 50,161.22, which is approximately Rs 13,000 better than the Indian price. Therefore, for the price of an iPhone 8 in India, you could go actually have a complete vacation in the UAE and a brand new iPhone 8, which seems like a better deal than an iPhone 8 alone. If you have a friend in the US, then you will be able to get the iPhone 8 64GB variant for the price of an iPhone 7 128GB variant, which isn’t a bad deal. The 8th edition of iPhone is the mainstream flagship offering from Apple this year, which is succeeded by the pricier iPhone X. India becomes one of the most important countries for Apple and a majority will be able to afford the 8 series more easily instead of the feature-packed iPhone X. The 8 series packs identical internals as the iPhone X, save for the display and the FaceID verification system. Delhi witnessed a cracker-free Diwali but air quality not better by standards! Mahalaxmiji Temple decorated with Rs. 100 Crore Cash in Madhya Pradesh!